Welcome to my red sports car. Now, let me explain that metaphor. When some men reach their 40s, they encounter the so-called mid-life crisis. Often, it manifests in the purchase of something symbolic of their youth. For many, it's the proverbial flashy, red sports car. (OK. I will admit on splurging on a new bike that helped me climb Mt. 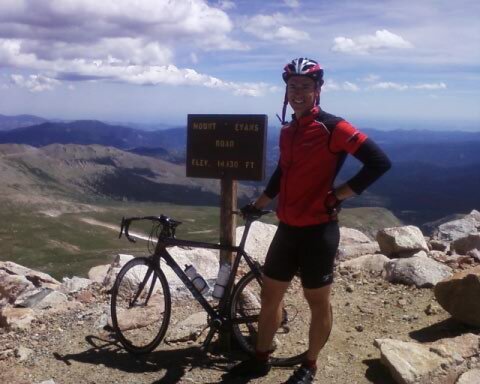 Evans in Colorado, the highest paved road [14,000+ ft.] in North America. That's me in the picture. Although I qualify for middle age (at least in the chronological sense), I chose not to mark it with an addition to the garage. Rather, I decided to start a wellness business. And, I'll admit, it's a selfish decision, but not in the traditional egocentric definition. I launched Good Cause Wellness because I could not find the nutritional products that served my needs. As a middle-aged, family-oriented man, I searched (in vain) for high-quality products that could be easily incorporated into my life. I didn't want to take dozens of pills or try to choke down a good-for-you, but nasty tasting drink powder. I already had an excellent diet and exercised (biking, swimming, hiking, yoga and Pilates) vigorously six times a week. Still, I knew that as I aged, I needed to do more to support my body, its systems and what's left of my mind! The products sold by Good Cause Wellness fulfill my needs. So, if that is selfish, then I'm guilty. However, it also means I can personally attest to the quality and the benefits of everything we sell. Take our Good Cause Wellness Chia Seeds, for example. I can't imagine a product that is easier to incorporate into your current diet. Its incredible nutritional profile (high in essential omega acids) make it a true superfood. I add chia to my morning fruit smoothie and to the banana and pumpkin breads I bake. (Don't tell my kids!) Is there any easier way to add so much nutrition to foods you are already eating? I doubt it. Living in the desert and exercising outside in the harsh sun makes me concerned about its effects on my skin. I've found that our Astaxanthin and Aloe Vera100 Drink Mix help protect my skin. People often guess that I'm five or six years younger than my chronological age. Our Good Cause Wellness Antioxidant Defense System Red and Purple taste so good you can mix them with water or juice. But the appeal of these products is more than just the great taste. They add essential nutrients to help the body fight off the effects of aging and antioxidants. These are just the type of benefits I sought, but couldn't find in other mixes. Even though I was eating a good amount of fruits and vegetables, adding these mixes to my daily routine really advanced my nutrition and health. Our high-quality Good Cause Wellness Nopal Powder is one of my favorite products. I think of it as my secret ingredient. While I know it is doing great things to lower my cholesterol (and my lab tests prove this), it helps me get through my typical afternoon energy lull. The Nopal is effective not because it contains stimulants, but rather, it helps regulate my blood sugar level and provide a consistent level of energy. Like anyone approaching middle age, I am concerned about the effects of aging. I know 40 is the new 30, but I still didn't want to concede to the calendar. To help fight the effects of aging, I take daily Good Cause Wellness Resveratrol. It's a simple way to keep my brain, skin and eye functions healthy ("Excellent eye health" commented the doctor on my recent check-up.) It is useful in improving memory and mental alertness and I'll take whatever help I can get in this area! In addition to improving my wellness, I wanted my company to help the wellness of others. I believe we can make the greatest impact by donating to existing organizations that promote consumer awareness, healthy lifestyles and intelligent consumerism. So when you buy from Good Cause Wellness, you are doing something positive for your wellness, but also helping to improve the wellness of others. While I might get enjoyment (and a momentary reminder of youth) with a new sports car, I know the best investment I can make is in my health. I hope you enjoy and benefit from the products of Good Cause Wellness as much as I have.